Marketing and Production oftentimes look at different issues with different lenses. When Marketing is looking for enough capacity, Production looks for sales forecasts. When Marketing gives premium to variety, Production wants to keep the product line narrow. The relationship between the two departments is intrinsically complex, but with the right management approach, the operational creases can be ironed out. Today, the global market is experiencing a nascent but encouraging recovery from the downturn of the recent years. Businesses are taking advantage of the favorable economic climate, and have been very bullish in selling and introducing new products and services. From the outside looking in, anyone may think that the process to achieve these broad targets will be fairly simple: Marketing should sell as much as possible, and Production should strive to keep up. Such a simplistic view of the process will most likely exult only the areas of cooperation, missing the fact that the same points may be sources of potential conflicts. For most Marketing professionals, keeping customers satisfied is the be-all and end-all of their existence. For them, delivering quality products or service at the time the customers want them is the hallmark of a successful transaction. Thus, it is easy to blame Production when delays occur. Since most marketers are oriented towards customer satisfaction, they may not share the same priorities with the production professionals. Delays, for instance, may arise from a slower pace of production, aimed at making higher-quality products and cutting down on customer returns and complaints. In cases when this becomes a major issue between the two departments, the need to determine if the value of the quality control measures is worth the price of lower production should be treated with urgency. In most cases, issues driven by personal circumstances are always the trickiest to address. The managers of the Marketing and Production departments, or any department for that matter, almost always ascend to the role with their own set of experiences and educational, professional and cultural backgrounds. Frequently, handling conflicts among managers requires a director or a president to look beyond the issues and understand the personal motivations each has. One solution, however, is to lay out clear lines of authority. Despite the inherent complexity of the inter-departmental relationships in an office, directives that come from above are almost always followed to the letter by staff members and managers alike. There are cases when the Marketing and Production departments contain their conflict and keep upper-level executives out of the loop. There is real danger in doing this, because if such struggles are not kept in control, resentment may grow and staff members may lose focus on their jobs altogether. Upper-level officers need to be in the feedback loop so that they may help resolve such conflicts during regular meetings with the Marketing and Production teams. Production is almost always isolated from the market, while Marketing continually sees the everyday evolution of the business and learns about the customers’ ever-changing demands. To bridge such a gap, top-level managers should step in and formulate production standards that reflect innovations in response to the changes in the market. 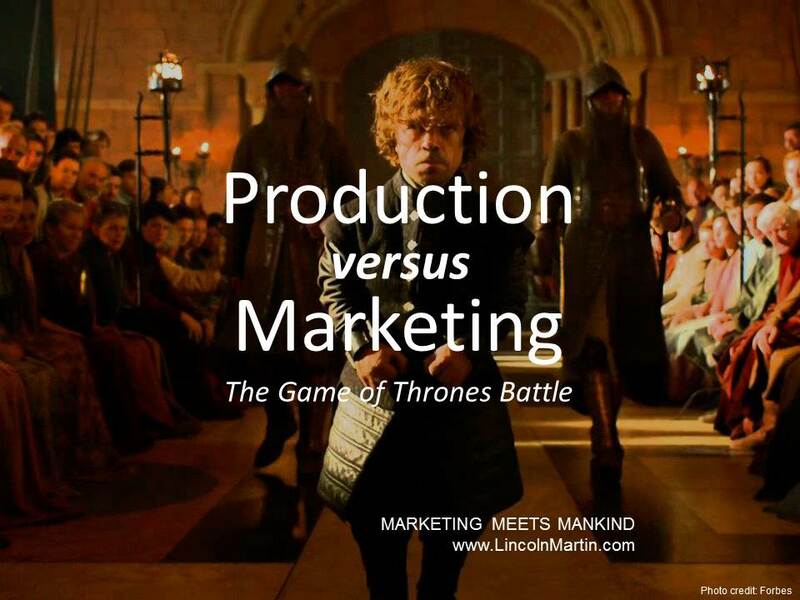 Conflicting departments are not so different from the warring houses in Game of Thrones. They have their own attributes and desires that lead them to either go up against each other or align themselves with another. Robert Baratheon once explained how the power of an army could work. In one scene, he held up five fingers, and then held up one finger. Then, he asked the queen which number was greater. Low and behold, she guessed wrong. The truth is, Baratheon said, power comes in one unified approach. That until today is true. In this day and age of a highly challenging economic landscape, a cohesive corporate team is more powerful than a group of enthusiastic individuals working independently. Tension between departments are important, because they ensure effectiveness and efficiency. The top management, however, should work towards maintaining a constructive amount of push-and-pull by making sure that both the Marketing and Production departments understand the essence of a balanced situation but still zealously represent their own expertise, interests and objectives.